Located just ten minutes from the Airport the Hilton Hotel Southampton offers a tranquil setting with all the facilities you would expect from a four star hotel. There is a choice of standard rooms or suites all of which are en-suite and include tea and coffee facilities, high-speed internet TV, radio and telephone. For that early morning start grab a coffee from the on-site Costa, cakes sandwiches are also available, along with complimentary newspapers. There is a choice of two places to eat; The Pavilion Bar or the Pavilion Restaurant. For light snacks and drinks whilst enjoying the latest sport on TV the Pavilion Bar is ideal. The Pavilion Restaurant, offering a full a la carte menu, provides a fantastic location to relax before your flight. The fully equipped LivingWell Health club has a 13 meter indoor swimming pool, sauna and steam room and fitness area. 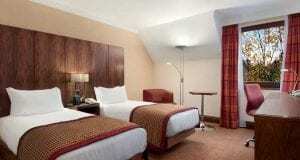 The Hilton Hotel Southampton is also very convenient for cruises from Southampton port.